It is with pleasure that I warmly welcome you and your family to our Southern River College. We are a student centred community focused on relationship building with our students and their families. We want our students to learn, grow and achieve. We are dedicated to quality instruction that promotes academic excellence through an enriched and rigorous curriculum whilst nurturing student’s social and emotional needs. As a staff, we are here to support you, to assist your children as they learn and develop their skills and talents. Our vision for Southern River College is to develop confident and active global citizens by creating opportunities for all students Years 7 to 12 as they progress through their educational pathways. Our College promotes academic excellence and vocational aspirations for our students, celebrates their diversity and fosters their ambitions. The College has an array programs and initiatives, making a real difference to many students and their future aspirations. Southern River College seeks to create opportunities for all students as they progress through their educational journey. Along with a general education program our educational programs include Academic Enrichment, Vocational Education Program and STEM Enrichment Programs. We support our students cultural and sporting pursuits through our Inspire Programs in Music, Soccer and Netball. The College is a Positive Behaviour Support School, promoting values throughout classrooms and our community through practice and use of our values. This has been highly successful in building school culture and community. Our RIVER Values are: Relationships, Identity, Virtues, Excellence and Respect. Flexibility is the key to Southern River College’s ability to support students in achieving their post school destination. Southern River College has a diverse population that is complex yet rewarding as we work together to achieve success for all. We strive to make a difference to each child and we are innovative and creative in our purpose. Our learning areas develop their curriculum programs aligned to the Western Australian Curriculum and Standards. We recognise that not all students learn at the same levels and provide support programs via our Teaching and Learning Centre (TLC), Literacy and Numeracy Development Classes and our Specialist Autism Learning Program (SALP) for students with high functioning Autism. Our teachers are committed to developing their skills in teaching and learning building the quality of our staff through best practice research. At Southern River College we want to invest in our student’s future by being open to their diversity and aspirations. We achieve this by creating enduring partnerships connecting industry and education together using exemplary practice. We recognise we are part of a global world and apply real world modelling in our classrooms and teaching practice. For our students to excel we promote academic excellence and vocational aspirations for our students. We want our students to be confident and active citizens. 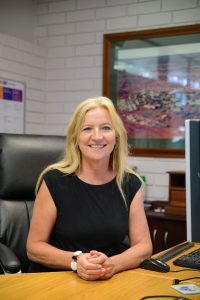 The College has aligned itself to becoming a Minerals and Energy Academy with a large focus on STEM initiatives and is supported by the Chamber of Minerals and Energy, Chevron Australia, TOLL, The Smith Family, The Petroleum Club, Gosnells Education, Training and Industry Links, The Beacon Foundation, Curtin and UWA Universities. The College is the first school in WA to establish a focus on Minerals and Energy, with 2013 seeing the first intake of students in Year 7 and 10 studying academic, technology and trades areas. Our programs align to the Australian Curriculum, Courses of Study and Skilling WA to help increase participation of young people in the mining and resource sector. Our students have exposure and opportunities beyond the normal curriculum to engage in STEM related fields with industry. Along with this focus our College operates Inspire Programs in Music, Netball and Soccer giving students opportunities to explore the arts and sports. We are a school that works with our greater community inviting them to be part of our College with the Wood Turners Association Gosnells Group, Southern River Community Garden, P&C, and also School Board based onsite, along with a host of community groups that use the College facilities after hours. Our goal is to inspire our students to become critical thinkers, active problem solvers, inquisitive readers and, proficient writers as they find their way in a contemporary and changing world and we look forward to the opportunity of working with you on your child’s learning journey.